Recently we had a strong storm pass through southeast Virginia. I was a little concerned about the road to my house while I was driving home from work. 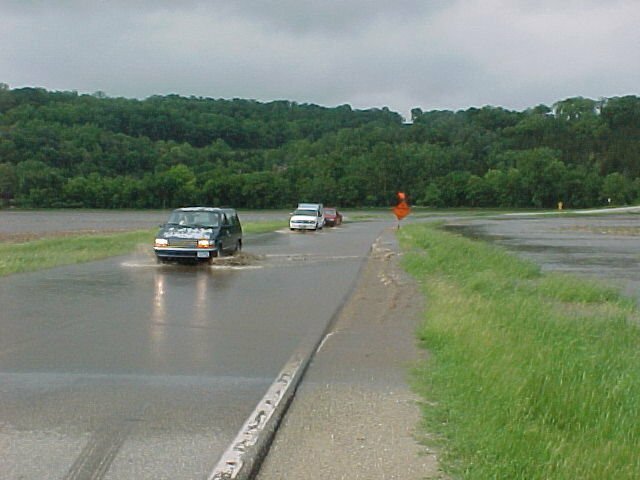 You see, that road has a low spot; and a rainstorm can cause flooding during high tide. Now when I say flooding, I don’t mean that cars are swept away. But water can cover the road at times like this. As I turned onto the road, I saw water ahead, and there was a car stopped about 50 feet in front of the water. The woman driving that car would move forward slowly and then back up…and she did this three different times. I could tell she wasn’t sure whether it was safe to drive through. Then she stuck her arm out the driver’s side window and waved it in the air. I wasn’t sure what that meant, so I waited to see what she was going to do next. A few minutes later, the driver put her car in park, jumped out, slammed the door and stomped back towards me. She YELLED at me, visibly angry and upset, saying that SHE was not going to try and go through and I could go ahead if I wanted to. In the past I’d made it through OK when the same stretch of road was flooded, so I decided to drive up closer and check it out. I’m an entrepreneur, after all, and I’m always taking calculated risks. As I approached the water, I looked out the window and could see that it was only a few inches deep. So I decided to go ahead. I kept my foot off the accelerator and just glided along to avoid splashing water on the engine. As I got to the dry pavement on the other side, I looked in my rearview mirror and I could see the woman was still fretting over what to do. That incident taught me a lesson about how assumptions influence behavior. The driver couldn’t tell how deep the water was, so she assumed it was too deep to drive through. She was so fearful that it didn’t occur to her to get close enough to see for herself. Her emotions over-ruled her ability to assess the situation rationally. #1 - What assumptions are causing me to have this fear? #2 - How can I check whether these assumptions are actually true? When you find yourself in a difficult situation and you’re not sure what could happen, don’t automatically assume the worst. Move forward, trusting that you’ll learn how things really are and what you need to do. Taking action will also give you the confidence you need to take the next step. And be sure to give yourself credit. You’ve faced the unknown before, and you did fine. Reflecting on your past successes serves as a reminder that you can handle your current challenge, too. A corollary is when we add meaning based on "evidence" that just isn't there. My wife gave our 3 year old medicine for her ear. Five minutes later my daughter complained that her ear still hurts. But then an hour later, at a neighbor’s house, she said she felt better. “The medicine doesn't work at our house” she said. We grown-ups make the same mistake. We add all sorts of meaning (i.e., assumptions) that we just don't have evidence for. We assume we know why that prospect didn't call back. Or why our boss said what he said. And so on. We draw conclusions and make decisions that are based on imagination, not reality. The ability to see “reality” as it is, is one of the most valuable skills we entrepreneurs can master. Dov, Love your story about your daughter - and your insight about the erroneous basis for our assumptions. You are absolutely right about seeing reality - but it's not just having the ability, it's also having the willingness to look it in the face. Willingness = courage, confidence, patience, persistence, faith, etc. What a great story to remind us to check our own assumptions. That can be tough to do; we like to believe our own assumptions. But you make a good point; to get to where you want to go...you really have to know the truth! Thanks for a nice reminder. The very fact, that we call them "assumptions" should prevent us from acting on them. I wonder, if the woman learnt anything from you? I wish she had seen you drive through, and learnt that she too could drive across. I think as humans, we miss out on the reality by getting stuck with our assumptions. Alice and wordwhacky, Thank you for your positive feedback and additional insights about making assumptions. We definitely miss out on a lot - and we often avoid doing things we COULD do - because of our assumptions about them. I appreciate your taking time to visit and comment!